We’ve recently heard rumors about a potential rebirth for Nokia next year, when its contract with Microsoft will be up and they’ll be allowed to make their own phones again. 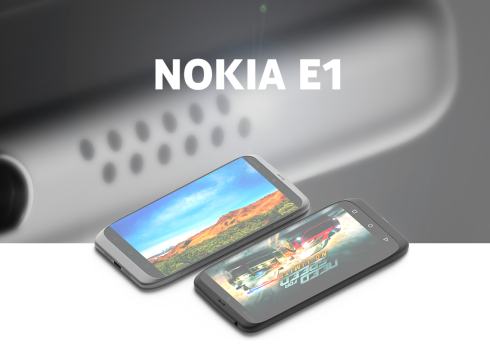 In the meantime we’re content with concepts, like the Nokia E1 shown below and rendered by Dmitriy Mezenin from Russia. I’m happy to see that this handset doesn’t seem to bother from Lumias or from other older Nokia phones. It seems to be running Android, which is probably what’s going to happen in reality. Its format reminds me of the concepts that Nokia proposed before launching the N9, all of them looking better than the Lumias. It has a fully laminated zero air gap display, with a 4.95 inch diagonal and Full HD resolution. The handset comes with an Intel 64 bit processor, 2 GB of RAM and a 20 megapixel back camera. It also has Wolfson acoustic technology, a 2700 mAh battery and a 6 axis gyro and accelerometer. The OS is predictably Android 5.0 with Z Launcher on top. Its case has narrow bezels, but also a very subtle curve, that I appreciate. From what I see it’s made of a more solid plastic material.